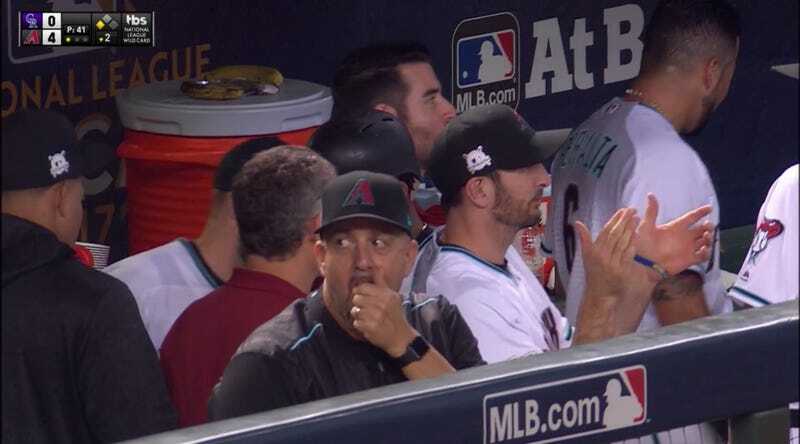 According to a report from the New York Post, Major League Baseball officials are looking into whether Diamondbacks assistant coach Ariel Prieto used an internet-enabled watch for espionage purposes during last night’s Wild Card win over the Colorado Rockies. Prieto can be seen above wearing some sort of watch with a large face, and MLB rules prohibit the use of internet devices in the dugout since they can possibly be used to steal signs. Neither MLB nor the Diamondbacks commented on the reported investigation, and ESPN later corroborated the Post’s report. Last month, the Red Sox were fined after being caught using a smartwatch in their dugout, and commissioner Rob Manfred warned that more prohibitive measures would be taken against sign-stealers in the future. Prieto has worked as an assistant coach and translator for the Diamondbacks for three years. The Diamondbacks begin their NLDS series against the Dodgers tomorrow night.